1. Preheat oven to 350°F. Toss apple and pear slices with lemon juice and vanilla in large bowl. Mix cornstarch and 2 teaspoons cinnamon in small bowl. Sprinkle over fruit; toss to coat well. Spoon into 11x7-inch baking dish sprayed with no stick cooking spray. 2. For the Topping, mix brown sugar, flour, oats and 1 teaspoon cinnamon in medium bowl. 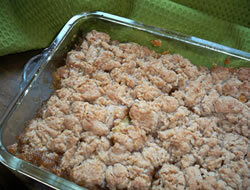 Cut in butter with pastry blender or 2 knives until coarse crumbs form. Sprinkle evenly over fruit. 3. Bake 40 to 45 minutes or until fruit is tender and topping is golden brown. 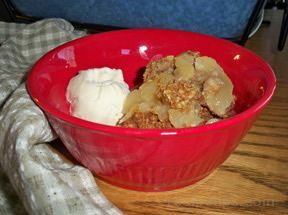 Apple Crisp or Pear Crisp: Prepare as directed. Use all apples or all pears. Spiced Apple Pear Crisp: Prepare as directed. 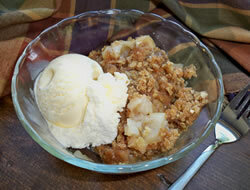 Use 1 teaspoon McCormick® Apple Pie Spice in place of the cinnamon in the fruit filling and 1/2 teaspoon Apple Pie Spice in place of the cinnamon in the topping.